I'm a little bit desillusioned by this season's Ferrari gear. I really don't like that one-white-arm thing and that beanie looks like a peppermint candy. I don't mean to be to critical but Ferrari usually have cool gear. And now that they also have a cool model, they could have cashed in on the oportunity. A good start with Kimi Raikkonen and James Allison on the same wavelength at the end of the second of four days of testing at the Jerez circuit in southern Spain. Weather: air temperature 9/14°C, track temperature 10/15 °C. Light rain in the morning, sunny and cloudy in the afternoon. Second day of testing at the Jerez de la Frontera circuit for Kimi Raikkonen at the wheel of the F14 T.
Because of the wet start to the day, the morning programme began with the testing requested by Pirelli, relating to development of their wet weather tyres. The Scuderia was quickly able to assess the intermediate tyres, thus making the most of the time remaining and the progressively drying track to begin work on the car in preparation for the afternoon’s programme. By the end of the day, Raikkonen had managed to complete a total of 47 laps, the fastest in a time of 1.24.812. He continued the task of checking the car’s functionality as well as trying a few set-up changes. Testing continues at this circuit tomorrow, when Fernando Alonso will make his season debut on track. It does look as if the car has some oversteer, and Gary Anderson mentioned the same thing, although he listed it as fault. Of course you dont want too much oversteer, but I'd rather see Kimi dealing with oversteer then with understeer. 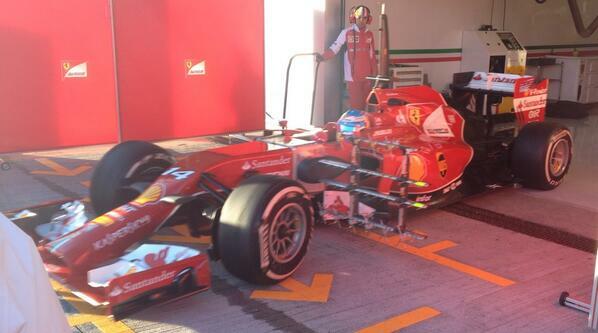 And there are rumours that Ferrari has a longer wheelbase so it will be good if the car is more prone to oversteer. Some nice word from Allison, it is great that he and Kimi has just worked together. Alonso goes to the top and he has already done 11 laps. Kimi drove at the afternoon the brake balance tests, Ferrari has only focused on electronic side of the car, not so the performance . Tho Kimi did do a bit of set up work already. Kulta mentions in the blog of his that there is already full steam at the both sides of the garage, Kimis race engineer was selected because he is extremely competitive and straightforward, they just suit to each other with Kimi very well and their co-work started at once with full fire. Thr Renault engine of the STR stil doesn't sound good and Vergne isn't driving on full power, he is 20 seconds off the pace. And Red Bull hasn't opened their garage yet. It is nice for Alonso Kimi has already done the donkey work for two days now Alonso can get mileage and fast times. I do hope Kimi's side of the team really works for him, and they are not just there to see towards Ferrari's needs. I will properly never trust Ferrari. Me neither..but its going to be interesting to see how it pans out. Kulta mentions also , Kimis softer driving style suits to this car but he reminds Alonso is adaptive. Will see. It looks like Alonso is doing aero work. It will certainly be interesting. Yes it does seem like Alonso id doing aero testing. I just hope Ferrari plays fair for Bahrain test, let Alonso run first 2 days (do so ground work) before Kimi takes over on 3rd & 4th day.